It has been a long time in the making, but finally we have a nice fjord circulation in our tank! Pierre and I tried to improve it 6 years ago, Steffi, Ailin and I have been working on it for a couple of days last August, then finally this morning, Steffi and I tried again — and it worked beautifully right away! When tipping the tank to empty it, a lot of turbulence was created at the sill (see movie below). While a fjord typically isn’t tipped very often, what we see here is basically what tides do on the sill (see the waves that keep going back and forth over the sill after the tank is initially lifted? Those are exactly like tides). 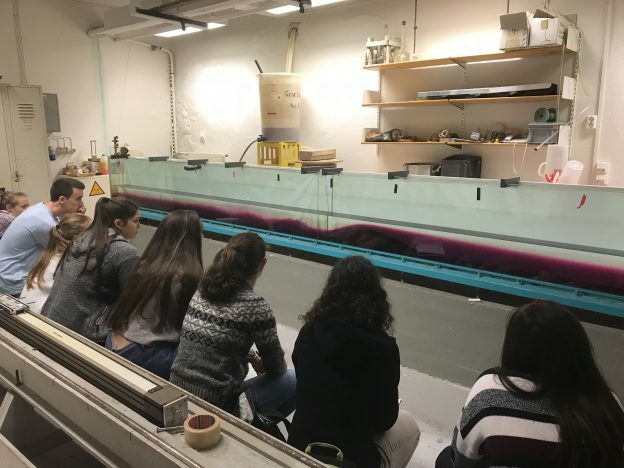 This could purposefully integrated in teaching rather than only happen by accident, those waves could be created just by surface forcing rather than by tipping the tank. That’s a very nice demonstration to explain high mixing rates in the vicinity of steep topography! And then there is also the issue of very low oxygen concentrations in some Norwegian fjords, and one proposed solution is to bring the river inflow deep down into the fjord. The idea is that the less dense river water will move up to the surface again, thereby creating mixing and oxygenating the stagnant deep water that, in some cases, hasn’t been renewed in many years. 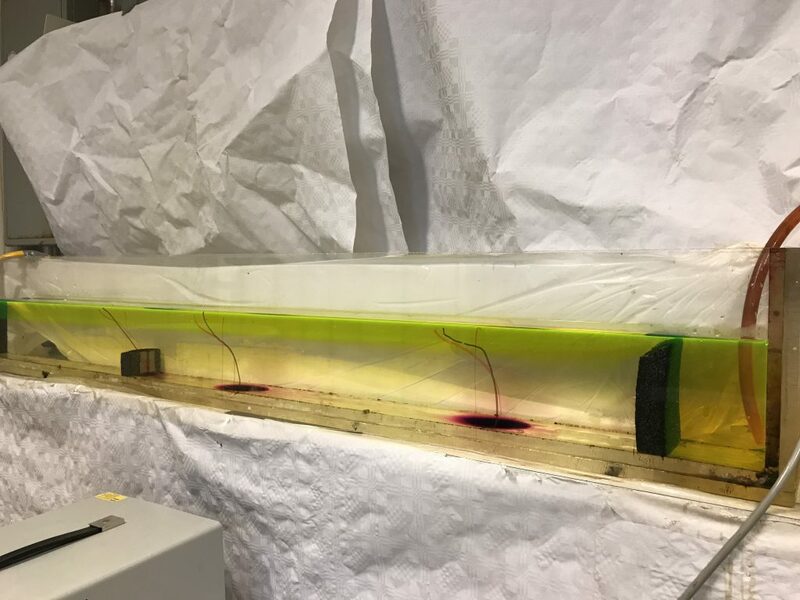 This entry was posted in demonstration (difficult), hand-on activity (difficult), tank experiment and tagged entrainment, fjord circulation, mixing, mixing at sill, sill, tank experiment, tidal mixing, velocity shear on February 12, 2019 by mglessmer. How will lee waves look differently if we are using the asymmetrical mountain instead of the symmetric one? And is symmetry actually important at all or are we just looking at different slopes downstream while the upstream slope doesn’t have an influence on the wave field? After admitting I had only ever used the symmetrical mountain to generate lee waves in the long tank in the GFI basement, I had to try the asymmetrical one! But then it would be really interesting to see what the difference would be, right? I tried two different stratifications. Since I just wanted a quick idea of what this mountain would do, I used leftover water I had prepared for the moving mountain experiment. Since there wasn’t a lot left, I ended up with 11.5 cm fresh water, but only 4 cm salt water at approximately 20 psu (since I stretched the 35 psu a little). The water is very shallow, meaning mixing is happening over the whole water column. It might not actually be more mixing than in the other case, but since it’s affecting the whole water column, it might just seem like more because no clearly visible stratification is left above and below the layer which is mixed by the mountain? The left side of the mountain was bent up a little (as in 2 or 3 cm), meaning that especially on the way back it was flapping up and down on the upstream side, doing a lot of mixing that wasn’t due to the shape of the mountain, just of bits of it being loose. And the shape of the “reservoir” that is being built up upstream of the mountain is different to what I have observed before: Running in either direction, the reservoir didn’t built up smoothly, but as a hump that was pushed in front of the mountain. Maybe because the internal wave speed in this case was very close to the speed of the mountain, something like 7cm/s, so the disturbance created by the mountain couldn’t propagate upstream. Is that an upstream hydraulic jump we are seeing there?! What’s also cool: Lee waves are now not only happening as internal waves, but you see a very clear signature in surface waves! Usually all we see are surface convergences and divergences, adjusting the surface layer to the internal waves underneath. That we now see surface waves is, I am assuming, mainly due to the shallow water relative to the height of the obstacle. You now see a wave train with wave lengths longer than in the symmetrical case. Probably due to the longer length of the obstacle (even thought the waves are still shorter than the obstacle)? Or what sets the wavelength? This time, with a faster internal wave speed of around 10cm/s while the mountain is still pulled with 7cm/s, we don’t see the “hump” in the upstream reservoir — the signal can propagate faster than the mountain and thus smoothes out. So that is what I think is going on here. While the first experiment mainly showed effects of the stratification compared to previous experiments, the second one might provide some insight on the different slopes of the mountain, although I am not sure in what way. Do you see something I didn’t observe? How would you expect the different slopes to influence the lee waves? I am so glad I tried this and I’m looking forward to thinking about this more! :-) Any insights you’d care to share with me? 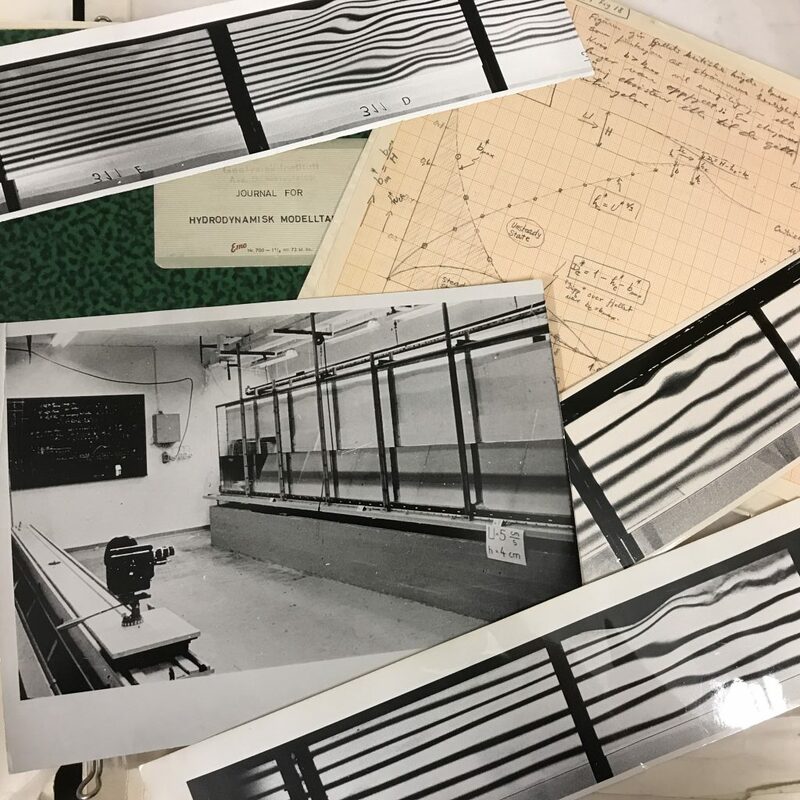 This entry was posted in demonstration (difficult), hand-on activity (difficult), tank experiment and tagged GEOF213, internal waves, lee waves, tank experiment on October 25, 2018 by mglessmer. Fill in what will end up being the top layer: 5 cm at 0 psu. For this, connect the tap to the bottom inlet in the left corner of the mountain with one of the hoses. When you are done, make sure to close the lock at the tank! Prepare the future bottom layers one by one (35 cm at 35 psu). We will need four full fillings of the 80l barrel (which doesn’t empty all the way because the tap is slightly elevated from the bottom, in case you were calculating ;-)), each with 2.8kg salt dissolved in it. To prepare that, connect the hose from the tap to the outlet of the barrel, put in the salt, put in the dye, use a paddle while you fill the barrel with water to stir. This way the salt will be pretty much dissolved by the time the barrel is full. Note: Make sure the barrel is located high enough so that gravity will pull the water down in the tank from the barrel! Note: When the barrel is filled, close the lock at the barrel before disconnecting the hose to reconnect it to the tank! Fill in the bottom layers into the tank one by one. While one layer is slowly running into the tank, you have time to measure the salt for the next one. Generation of internal waves. Is there one, are there many? What are their wavelengths and speeds? Generation of surface waves and their size relative to the internal waves. Why? 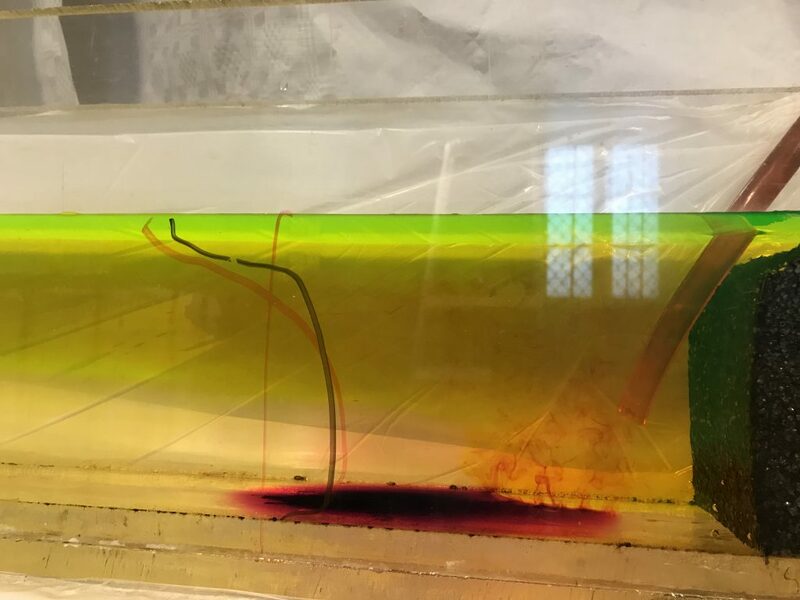 This entry was posted in demonstration (difficult), hand-on activity (difficult), tank experiment and tagged dead water, Fram, Fridtjof Nansen, GEOF213, internal waves on October 25, 2018 by mglessmer. Lee waves are the kind of waves that can be observed downwind of a mountain in the clouds, or downstream of an obstacle in a current as a series of undulations with crests parallel to the disturbance. Students sometimes find it hard to imagine that a moving mountain should be equivalent to flow across a ridge. It helps to discuss how it would be really difficult to set up a flow in a tank: A huge amount of water would need to be moved without too much turbulence. Instead, it’s a lot easier to imagine the water is moving by moving a mountain through the tank, so the water is moving relative to it if not relative to the lab. The size of the tank is 60×1.5×5 dm, so it can hold a total of 450l of water. The mountain we use is 10.5 cm high and 1 m long and it’s symmetric, so pulling it either way shows similar lee waves (which is why I’ve always used it). There is a second, asymmetrical mountain on the shelf that I have never used*. 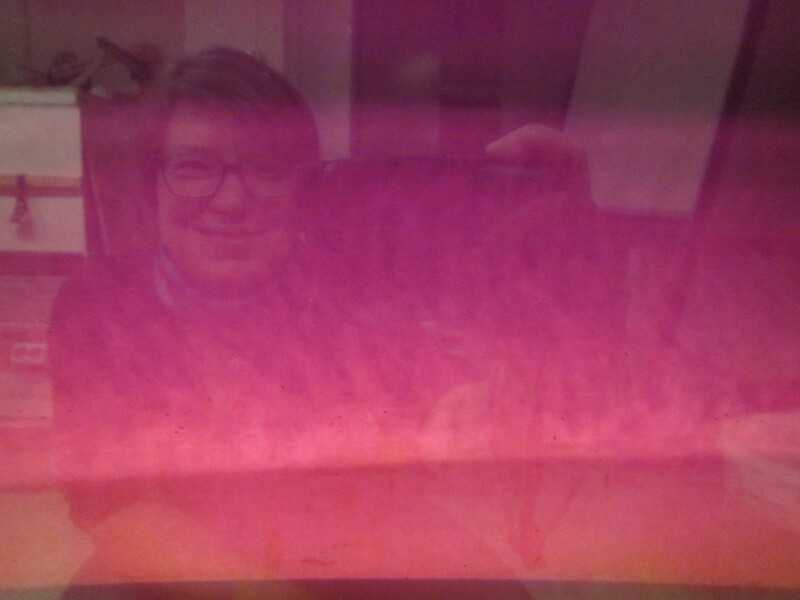 The stratification that we’ve found works well is 10 cm at 35 psu (here dyed pink) and 9 cm at 0 psu. This leads to an internal wave speed of approximately ~11cm/s. Prepare the dense water in a barrel that sits high enough so gravity will bring the water down into the tank (see picture below). For the 80l barrel, you need 2.8kg of salt and 1/3 tea spoon of dye MAX. You achieve the stratification by filling in the fresh water first through the bottom left inlet, moving the mountain over it, and filling in the dense water. That way the mixing is contained to the volume underneath the mountain which will be a lot better for your nerves (believe me!). 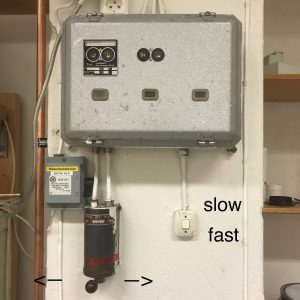 The system that pulls the mountain can go at two speeds: “fast” and “slow”, “slow” meaning 5m in 1:11min (7cm/s) and “fast” meaning 5m in 0:36min (14cm/s). As you see in the pictures above (or the movie below), there is a lot to observe! Here is a movie of the lee wave experiment. Feel free to use it in teaching if you like! And let me know if you need the movie in a higher resolution, I am happy to share! *Yes, this was true at the time of writing. But I am setting up that experiment as we speak. Write. Read. Whatever. Will post movies tomorrow! This entry was posted in demonstration (difficult), hand-on activity (difficult), tank experiment and tagged GEOF213, internal waves, lee waves, tank experiment on October 24, 2018 by mglessmer. Demonstration: Nansen’s “dead water” in a tank! A ship that is continuously pulled with a constant force suddenly slows down, stops, and then continues sailing as if nothing ever happened? What’s going on there? We will investigate this in a tank! 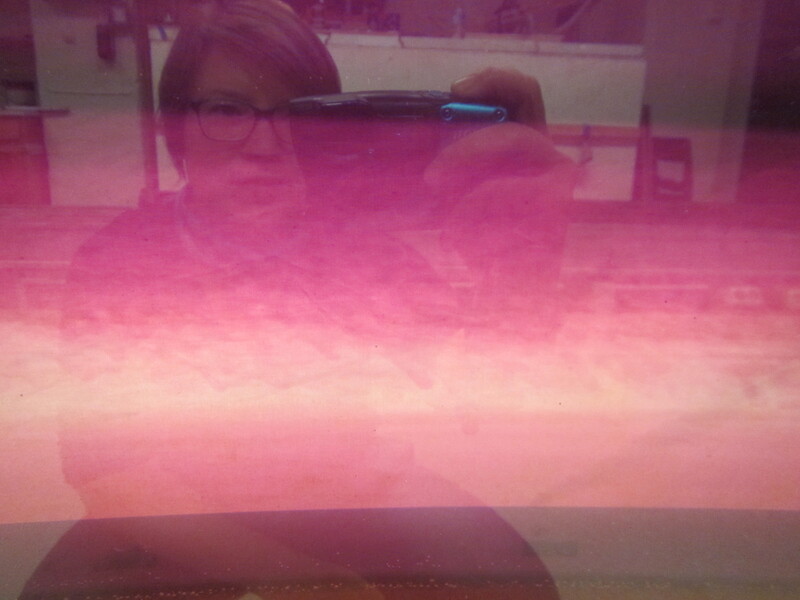 And in order to see what is going on, we have dyed some of the water pink. Can you spot what is going on? The setup for this experiment is discussed here and is based on the super helpful website by Mercier, Vasseur and Dauxois (2009). In the end, we ended up without the belt to reduce friction, and with slightly different layer depths than we had planned, but all in all it works really well! 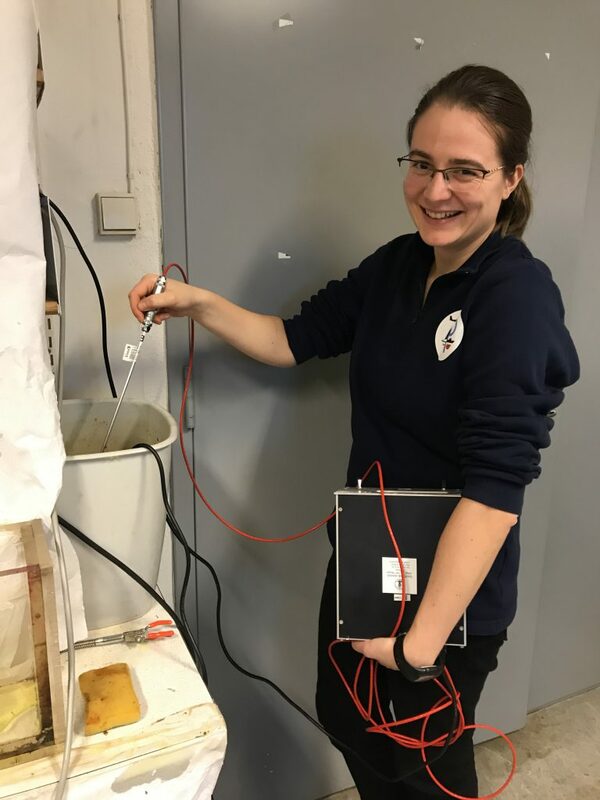 This entry was posted in demonstration (difficult), hand-on activity (difficult), tank experiment and tagged dead water, density, Fram, Fridtjof Nansen, internal waves, salinity, stratification, temperature on October 22, 2018 by mglessmer. 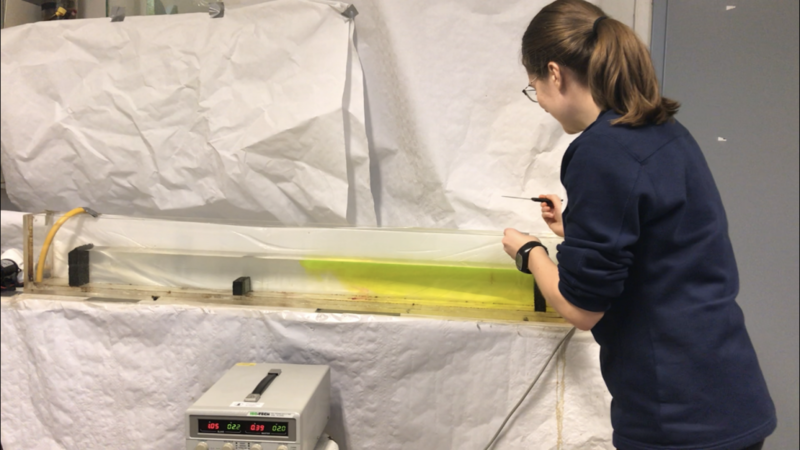 This entry was posted in demonstration (difficult), hand-on activity (difficult), tank experiment and tagged density, double diffusion, double-diffusive mixing, mixing, salinity, tank experiment, temperature on October 19, 2018 by mglessmer. During my last visit to Bergen in August, we set up a nice “dead water” experiment. 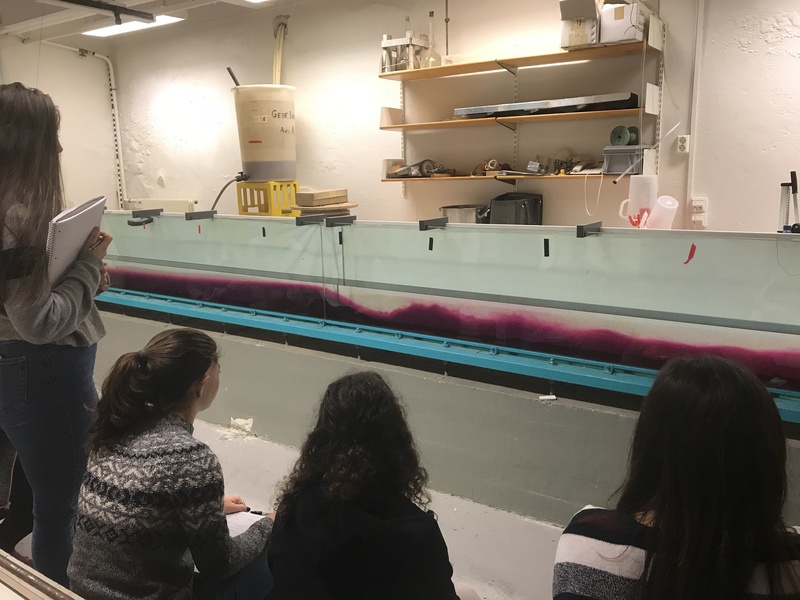 However, there are nice experiments, and then there are awesome experiments, and since Elin wants to use this experiment in her teaching of the ocean and atmosphere dynamics class, we are going for the latter! The ocean & atmosphere dynamics course is really theoretical. It would be nice to add something practical! At least for me it really helps to raise motivation to buckle down and think about the theory if I have observed something and I learn theory in order to understand or manipulate what I observed rather than just for the sake of learning theory. Internal wave experiments get complex very very quickly. This is a two-layer system that should be comparatively easy to both control (Ha! I wish…) and interpret (Ha!! Yes. I know…). This is a very nice historical example, too, going back to Nansen’s Fram expeditions. Nansen is a national hero in Norway, the Bjerknes Centre for Climate research which I am currently visiting is named after Bjerknes, who was involved in figuring this out. So lots of local references! John Grue’s (2018) article “Calculating Fram’s Dead Water” uses the historical observations described by Nansen in “Farthest North” (1897) to quantify the conditions that led to Nansen’s observations: Nansen found a reduction of speed down to 1/5th of the expected speed, and Grue relates this to a density stratification, specifically a pycnocline depth. I’m using the Grue (2018) article as basis for our stratification in the tank, which we set up to best resemble the one the Fram experienced. Grue describes a strong wave wake and force for a ratio of the ship’s draught (b0) to upper layer depth (h0) close to 1. For our model “Fram”, b0 is 5cm, which leads to an h0 of 5cm, too. We could obviously also use a smaller model ship with half the drought and we’d be fine. Maybe we should do that just to figure out if it makes a difference. To set up the density, we can manipulate both temperature and salinity of the water we are using. For practical reasons, the temperature the water in our tank should be room temperature (so the tank can sit all set up, waiting for class, without equilibration with the room messing things up). Temperature in the teaching lab was T0=20.5°C when I checked this morning. To minimize the amount of salt we need to use, we’ll use the freshest possible setup, with the upper layer having a salinity of S0=0g/l. 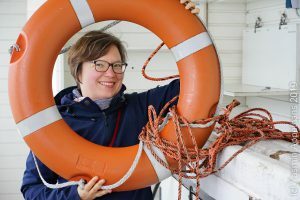 After just pulling it by hand in previous experiments (which was surprisingly difficult, because you need to pull veeery slowly, without jerking on the string), we’ve been thinking about different ways to move the boat. First we thought we should program an Arduino to really slowly pull the ship through the tank, and use a dynamometer (you know, one of those spiral feathers that shows you how much force is applied by how far it stretches. Or the easy version, a rubber band) to figure out the drag of the ship. But as I looked a little more into the experiment, and I found a really neat website by Mercier, Vasseur and Dauxois (2009) describing the experiment and the weight drop setup they used. They make the point that the dead water phenomenon is actually not about a constant speed evolution, it’s about applying a constant force and seeing how the boat reacts to that. Which I find convincing. That way we see the boat being slowed down and accelerating again, depending on its interactions with the internal waves it is creating which is a lot more interesting than seeing a feather or rubber band stretch and contract. Mercier et al. 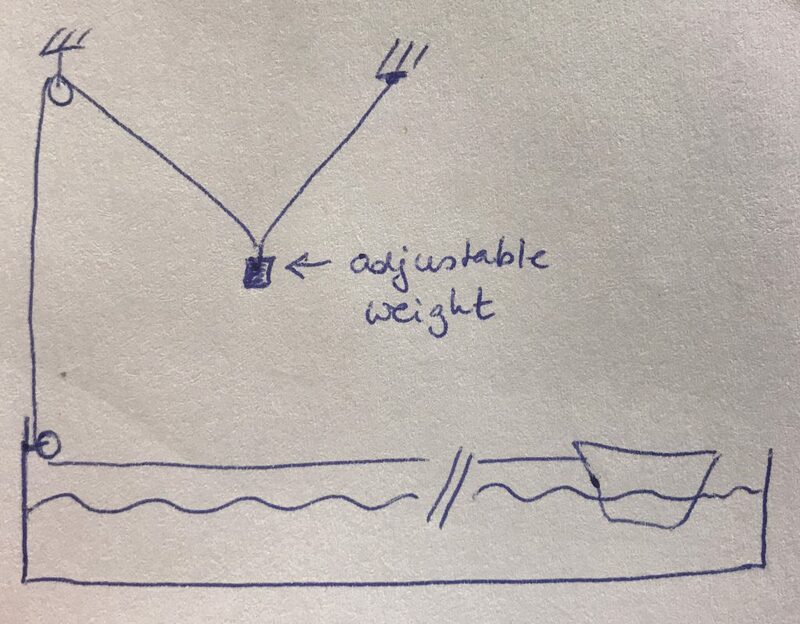 have the boat strapped to a belt with constant tension on it, which they then force via a pulley system with a drop weight of a few milligrams (I think our friction might be higher then theirs was, so we might need a little more weight!). Only problem here (and I am not quite sure how big a problem this really is): We can only pull the boat for a distance as long as the ceiling in the basement is high, and that’s definitely nowhere near the length of our 6m tank. That seems a waste, but maybe a shorter distance is still enough to see all we want to see (and at least we won’t have reflections from the ends of the tank interfering if we pick the stretch in the middle of the tank)? Or is there an easy way to use pulleys or something to have the weight seem to fall deeper? Any ideas, anyone? 10.10.2018 — Edited to include this idea I got on Twitter. This is so obvious yet I didn’t think of it. 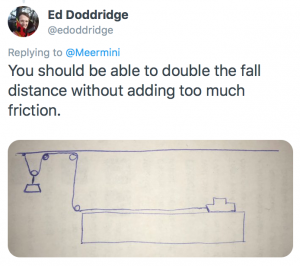 Thanks a lot, Ed, I will definitely try that! Also, is anyone still doubting the usefulness of social media? 11.10.2018 — Edited: Wow, as a sailor it’s really embarrassing that people have to point me to all kinds of different pulley systems to get this problem done! Only two issues I have now: 1) What I’ve been ignoring so far but can’t ignore any longer: The weight of the rope will increase with the length of the rope, hence the force won’t be constant but increasing, too. Since we are expecting to be working with weights of the order of a couple of paper clips, even a thin yarn might contribute substantially to the total force. Will definitely have to weigh the yarn to figure out how large that effect is! 2) Since we are expecting such tiny weights to be enough, all the blocks needed in a pulley system are already way too heavy, so we’ll have to figure out some light weight fix for that! Mercier et al. also used a magnet at the back of the ship and one outside the tank to release the boat, which is a neat idea. But, as they point out, one could also just release the ship by hand, which is what I think we’ll opt for. We could ask them to do basically what I did above — figure out, based on the Grue (2018) article, how to run a tank experiment that is as similar as possible to the situation Nansen described having experienced on the Fram. In the setup I described above, our ration of layer depths is 1/8 instead of the 1/18 assumed in the Grue (2018) article. Does that actually make a difference? Why would it? Do we think the differences are large enough to warrant running the experiment with the 1/18 ratio, even though that means changing the stratification and getting a new boat? gives a phase velocity of the internal wave of c0=0.1m/s, meaning that it would take a wave crest 1min to cross our 6m long tank. We’ll see how that holds up when we do the experiment! And we could ask the students to do those calculations and compare them to the observations, too. In their 2011 article, Mercier, Vasseur and Dauxois show the drag-speed relationships for dead water, deep water and shallow water (in Figure 1). The resistance will obviously be different for our setup since we’ll likely have a lot more friction, but qualitatively the curves should be similar. Might be fun to test! And also fun to interpret. Even if we concentrate on the dead water case only (so we don’t have to empty and refill the tank), there is a lot to think about: Why is there a maximum in the resistance in the dead water case with both lower and higher speeds having a lower resistance? Probably related to how the ship interacts with the internal waves, but can we observe, for example, which Froude number that happens at, i.e. how fast the ship is moving relative to the phase velocity of the internal wave (which we both calculate and observe beforehand)? 11.10.2018 — Edited: My former colleague Robinson pointed me to a research project he is involved in related to dredging the Elbe river (to make it possible for large container ships to reach the port of Hamburg) where they actually also look at how much ships are being slowed down, not by internal waves necessarily, but by the turbulence and turbidity they cause in the muddy river bed! That’s really cool! But the scaling is completely off from our experiment so their setup is unfortunately not transferable (they drag big objects with constant speed through the actual Elbe and measure the force that is needed). This entry was posted in demonstration (difficult), tank experiment and tagged dead water, Fram, Fridtjof Nansen, GEOF213, internal waves on October 9, 2018 by mglessmer. Waves in a density stratification. One of the most beautiful tank experiments I’ve ever seen. This entry was posted in demonstration (difficult), observation, tank experiment and tagged density, EDarelius&team, GEOF213, stratification, waves on August 16, 2018 by mglessmer. 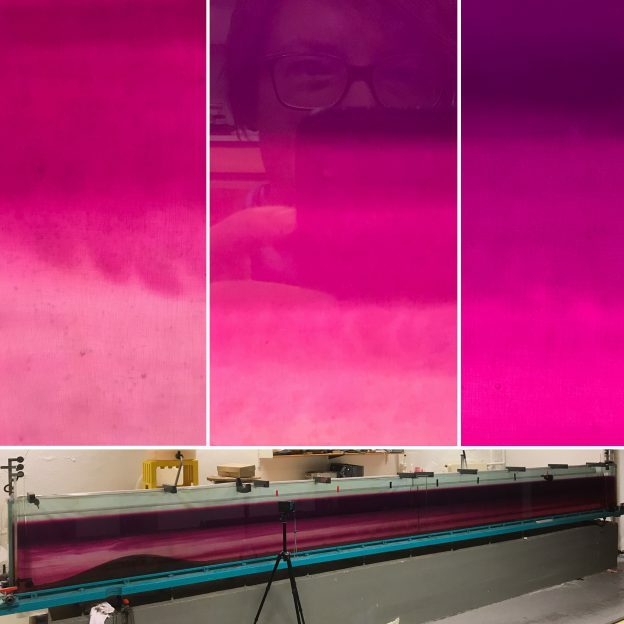 Now that we do have a really awesome 12-layer 6-color stratification, we obviously had to do the dead water experiment again. This time we chose to include a not-too-happy-looking Nansen on the ship, too! I love this even more than the one we did yesterday! This entry was posted in demonstration (difficult), tank experiment and tagged density, EDarelius&team, Fridtjof Nansen, GEOF213, internal waves, lee waves, ship-generated waves, tank experiment on August 16, 2018 by mglessmer.